Facebook Advertising can be of real value, particularly for companies and brands who sell directly to the consumer, with 2.23 billion monthly active users on the platform worldwide. The average person spends nearly two hours a day on Social Media, and so by targeting them through using a channel such as Facebook can prove to be extremely effective. But how can brands capitalise on the time spent on social media in order to boost sales? Delivering the right information to your audience at the right time can be key in how well a campaign performs. Think about when your target audience are online. If you know your audience are in full-time employment and work between 9am and 5pm, then don’t post at this sort of time! Target them when they are most active such as when they wake up, when they’re commuting, or in the evenings when they are scrolling through their social media channels while watching TV. However, consider the information you are giving to them at those times. Is your audience really likely to buy from you first thing in the morning? No? Then use your ‘morning’ post to greet them, remind them of your product and ‘warm’ them, leading them down the path to conversion throughout the day. Are you targeting the right proportion of your audience? Your target audience should be divided into multiple personas, which gives you greater control over who your campaign reaches. Ensure the content you are producing is suitable for that audience. Talk about the right things, whether it’s TV shows or football, post at the right time, and give them a reason to engage with your brand. Retargeting using Facebook Advertising can be highly effective. We have seen it work for numerous clients, and members of our team have also witnessed it be successful elsewhere, in industries from travel to flooring! In some cases, Facebook retargeting has delivered more than 7000% return on investment, purely by serving ads to visitors who had visited a particular product and not completed any sort of goal on the main website. This approach works particularly well for eCommerce companies, with the Facebook pixel seamlessly integrating with platforms such as Magento and Shopify, but you may also want to consider retargeting campaigns which are highly focused, meaning that adverts are only served to a specific demographic or portion of your predetermined persona. For example, rather than targeting everyone who has visited a product page, you may wish to only retarget females, aged between 34 and 45, as you know this is the demographic which converts the best. Ensure that you are making use of high engagement content, such as images, video and features such as Facebook Live, as these types of content are much more likely to attract attention to your page and your brand. Facebook Live is a great way in which to engage with your audience, with many of them likely to receive a notification when you ‘go live’, and gives you the opportunity to show off new products, launch competitions or even simply show that there is a human behind the brand – remember, people buy from people! Reviews can be a powerful tool to boost your sales, particularly when shared across social media. Whether you are sharing directly from a third-party such as Trustpilot, or whether you create your own graphics, sharing reviews from real customers gives your audience confidence in your brand. It’s social proof that your brand can deliver the product and service that they are expecting, and maybe even exceed their expectations. Never underestimate the power of a positive review. The Facebook Ads Manager is very helpful when it comes to setting up your campaigns, suggesting a number of different options around cost type, target audience and the type of ads you want to display, based on your overall objective. But it pays dividends to ignore a lot of what the wizard takes you through, and do it yourself. For example, don’t just settle for the CPM cost model, use CPC instead. Use multi-product carousels and tell a story through your advert, rather than just a carousel with products which bear no relevance to each other. Use video adverts, which not only give your audience a greater insight into the product your advertising, but this type of advert is more likely to be seen by other people, as the algorithm prioritises video content. When you delve further into Ads Manager, you will find many more options present themselves. 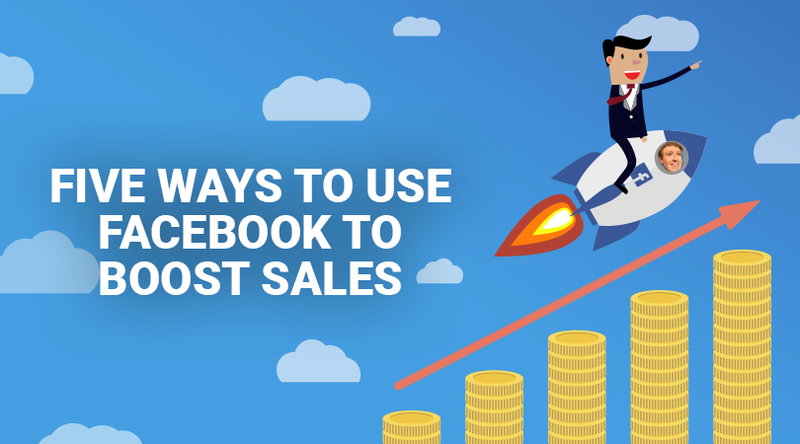 These are just five tips, but there are many more opportunities when it comes to boosting your sales through Facebook. If you would like more information on Facebook Advertising, then download our complete guide here, or get in touch with us!